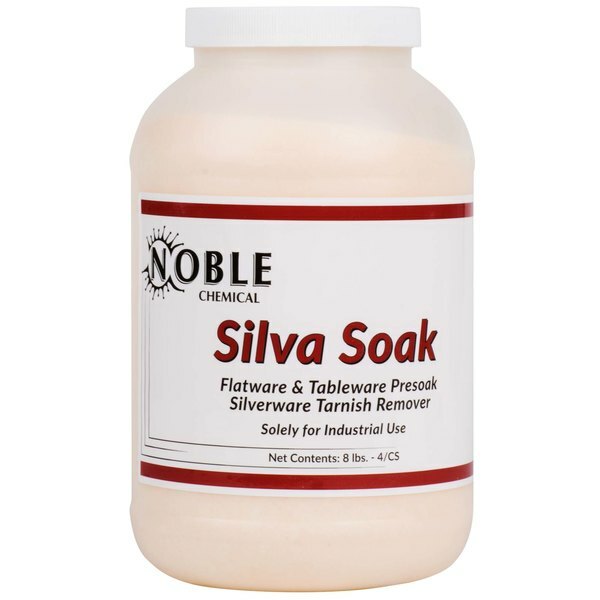 Give a sparkling clean tabletop presentation for your guests and customers with this Noble Chemical Silva Soak tableware presoak powder! This powder presoak effectively loosens, softens, and removes food soil films from silverware, stainless steel, flatware, glass, and any other tableware material. By using this tableware presoak, unsightly and unsavory food stains on "clean" dishes becomes a thing of the past! This presoak is also effective for cleaning up tarnished silver and can be used in both hard and soft water conditions. Sold (4) 8 lb. containers per case. Dilute 2 oz. per gallon of water for normal conditions. Use 4 oz. per gallon for heavily soiled or tarnished items. Presoak and detarnish at 140 to 150 degrees Fahrenheit for 10 to 15 minutes.